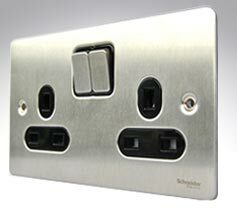 The switches and sockets featured in our flat plate section are available in a variety of finishes such as the contemporary white metal, stylish brushed steel and stunning polished chrome. Made on exceptionally thin plates ranging from as little as 1.5mm to 4mm they are sure to bring a touch of style to any interior. We stock a wide range from well known manufactures such as MK, Hamilton Litestat, BG, GET and Emcolite which are available for next day delivery. 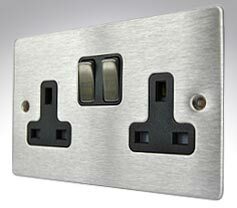 Have a browse through our extensive switches and sockets section where you're sure to find a flat plate to suit all styles and budgets. Very high quality steel flatplate in polished chrome or satin steel with black or white inserts. 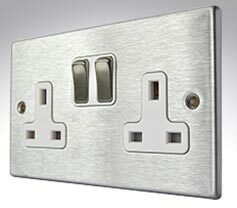 Hamilton Hartland low profile 5mm switches and sockets in a range of quality finishes. Very high quality 1.5mm flatplate from MK, the industry leading brand. 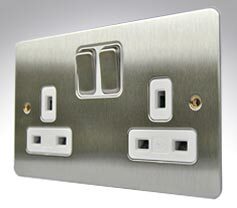 A very stylish, modern, ultra slim flat plate range of switches and sockets in stainless steel.